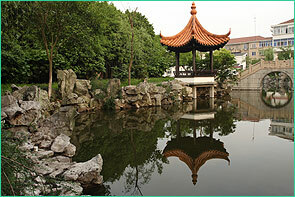 Taicang, or "Great Granary" in Mandarin, is a county-level city under the jurisdiction of Suzhou Prefecture City. During the Three Kingdoms Period (220-280 A.D.), the King Wu began to build the granaries on the land, which was called Taicang later, in order to store grain or rice. This initiated the town's booming economy and improved its transportation in later years. In the later years of the Yuan Dynasty, the ancient town was further expanded into not just a civil community but also a military base, in which the local municipal authority built moats, town walls and streets. A port under Taicang's jurisdiction, Liujia Port, was once honored as the "No. 1 Port in the World" in the Yuan Dynasty (1271-1368 A.D.) and was the port where Zheng He began his voyages adventures. These abundant storages, excellent harbor, and advanced technologies in ship manufacture all helped Zheng He's later explorations. Taicang City is located in the South Jiangsu Plain and on the southern bank of Yangtze River, close to the mouth of the river. The city borders Baoshan and Jiading Districts of Shanghai on the south, Kunshan City on the west and Changshu City on the north. The most important natural resources is its water resource, which occupies 30 percent of the land size of Taicang including more than half of the area belonging to Yangtze River surface. Other natural resources are not abundant. The city is under the influence of East Asia Monsoon, like its neighbor cities of Suzhou and Shanghai. It has a mild and humid climate and seasons are distinct. The average annual temperature is close to 15°C and the normal precipitation exceeds 1,000 mm yearly. Meiyu Season generally starts in the middle of June and lasts for about a month, during which the city experiences a period of mild rain but dampness. The physical size of the city is near 823 square kilometers and the water surface area 285 square kilometers including 174 square kilometers for Yangtze River water surface area. Its population is close to 460,000. Traditionally Taicang was a farm land and the agricultural earning was the principal income of the city. The main agricultural products include rice, cotton, oil seed, livestock, and aquatic produces. In the past two decades, the city's annual revenue from agricultural sector has been steadily shrinking and in 2006 it only occupied 6.6% of the city's GDP. The profound financial investment in the Yangtze River Delta has also enhances Taicang�s rapid economic expansion and industrialization. In past years, the city industrial income increase reached 15-24%. There are near 1,000 of new investment projects pulled in from German, US, UK and Taiwen in recent 3 years. The city has became one of the most well developed county-leveled cities in China, with its GDP frequently ranked among the top 15 counties in China. 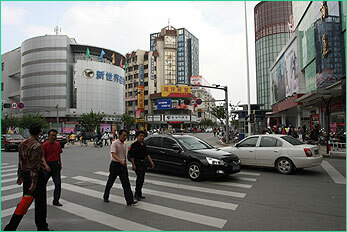 From 2001, Taicang has been ranked on the list of China's Top 100 Counties (county-level cities). Taicang Economic Development Zone (TCEDA) was established in 1991, covering an area of 80 square kilometers. It takes about 45 min to the downtown cow of Shanghai by driving. There is only 20 km away from the zone to the Taicang Port. Since its establishment, the economic zone has accepted more than 1,000 investment projects including more than 100 projects from German. TCEDA has become one of the most centralized regions for German companies all over China, including machinery, automobile parts and electronics. Economic growth and environmental conservation have always seemed like two different approaches. Many investment projects along Yangtze River have become significant in environment pollution. The local government has been putting stiff environmental policies into practice and has spent significant funds over years to protect its environment. The city's forest coverage rate is 14 percent of its total land. 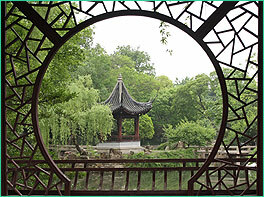 Taicang is 50 km away to both Suzhou and Shanghai metropolises, and the driving time to Shanghai Hongqiao Airport and Shanghai Pudong Airport are half and a hour respectively. Taicang has a convenient road transportation network including highway/expressway and railway. The expressways that are still under construction are Ningtai (Nanjing-Taicang), Sukuntai (Suzhou-Kunshan-Taicang) and Xitai (Wuxi-Taicang) expressways. Taicang Port owns 38,8 km of Yangtze bank and is one of prestigious river port along the river. The port has set up 14 national and international lines for cargo transport. 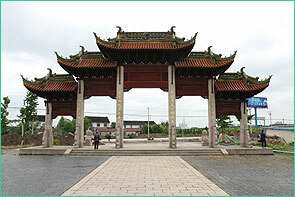 Taicang has many tourist destinations to visit, including Zheng He Memorial Hall, Taicang Museum, Tianfei Palace, and a couple of bridges built in the Yuan Dynasty.